Pentrich Colliery Pumping Engine, late 18th century. 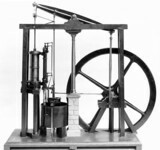 Newcomen type pumping engine, late 18th early 19th century. Thomas Savery, English inventor and military engineer, c 1690-1699. Newcomen winding and pumping engine, built 1810. Newcomen steam engine at Caprington Colliery, near Kilmarnock, 1897. Boulton and Watt Chelsea Waterworks Pumping Engine, c 1780. Pumping engine and beam engine, 18th century. 'General Arrangement of a Colliery Plant', 19th century. Newcomen Colliery winding engine, Coalbrook, Shropshire, c 1790.